Laser surgery can dramatically improve the appearance of your skin by effectively treating rosacea, and reducing the redness and enlarged capillaries that generally appear on the nose and cheek areas. 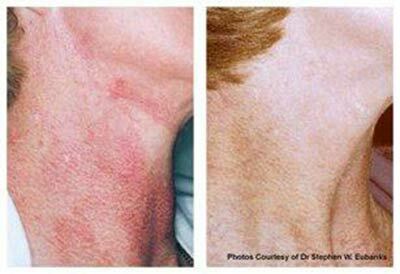 Several treatment options are available for rosacea, but the V Beam® laser is one of the best. The V Beam® laser is considered to be the gold standard for the laser treatment of rosacea. It also effectively treats many other skin conditions including enlarged capillaries, hemangiomas, port wine stains, scars, stretch marks, acne and poikilodema (red discoloration on sides of neck and chest). What is the V Beam® Laser? The V Beam® laser is a pulsed dye laser that delivers an intense, but gentle, burst of light into selectively targeted areas of the skin. The light is absorbed by small, superficial blood vessels in the skin and causes the blood vessels to shrink or disappear. What is treatment like with the V Beam® Laser? Dr. Hearth and his staff will ensure you are as comfortable as possible; most patients are reclined or lying down depending on the area being treated. Both the patient and Dr. Hearth will be wearing protective eye-wear. When treatment begins, the laser will be calibrated and parameters will be set based on the specific condition being treated. Each condition and each individual is unique and these settings maximize the results you will see following treatment. Depending on the type and severity of the condition, one or more treatments may be needed. However, significant improvement is usually observed with many conditions after one treatment. Some patients experience redness or mild swelling in the treated area immediately following treatment. This usually goes away in a few hours but may last longer in some patients. Occasionally purpura (like a bruise) may occur. Purpura is transient, and if it occurs, it is usually minimal and disappears within a few days. It is recommended to avoid sun exposure before and throughout treatment to maximize results. A sunblock of SPF 30 or higher should be worn daily during this time. Post treatment care guidelines depend on the condition treated and should be discussed with your dermatologist.